Review: 2014-10-24, good fight between Emanuel Newton and Linton Vassell: it gets three stars. Emanuel Newton entered this fight with a professional mma record of 24-7-1 (50% finishing rate) and he is ranked as the No.10 light heavyweight in the world, he suffered his last defeat in 2012 when he faced Attila Vegh (=Vegh vs Newton); since then he has won six consecutive bouts, the last one against Joey Beltran (=Newton vs Beltran). His opponent, Linton Vassell, has an official record of 14-3-0 (86% finishing rate) and he entered as the No.29 in the same weight class; he comes off nine consecutive victories, the last one against Virgil Zwicker. 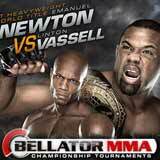 Newton vs Vassell, main event of Bellator 130, is valid for the Bellator light-heavyweight title (held by Newton). Watch the video and rate this fight!